It’s no secret that sugar isn’t good for your teeth. Here at Discover Dental, we always council our patients to consume sugary treats only on special occasions to help prevent tooth decay. What we don’t always tell them is that even dentists like to indulge in a little sugar rush now and then! The Houston Heights—the historic neighborhood where Discover Dental is located—is chock full of delicious restaurants and sweets shops. It would be a shame not to patronize our incredible neighbors, many of whom are offering world-class selections of tasty treats. Just remember that too much indulgence can ruin your smile! The more time you spend eating sweets in the Heights, the more time you’ll spend visiting us at Discover Dental, so exercise a little restraint. The best defense against the harm sugar can do to your teeth is to exercise proper oral care. Brush and floss every day, and do it particularly thoroughly after you indulge. Use a mouthrinse with fluoride to remove as much sugar and sticky residue as possible, and chew sugar-free gum after eating sweets to help clean your teeth. Now that you’re prepared, dig in! This small restaurant on Heights Boulevard delivers just what it promises: juicy fried chicken with the perfect skin and warm, savory donuts! If you like bacon, you’re in luck—Lee’s has bacon dipping sauce for the chicken and more sprinkled on donuts. Got a pecan pie craving? Or maybe you’re a strawberry-rhubarb person. Whichever your preference, you owe it to yourself to give Mighty Sweet a try. This shop opens at 11 a.m. on Friday, Saturday, and Sunday, and they close at 7 p.m.—earlier, if they sell out. Get there early enough, and you can snag a Snickers pie! You’ll definitely want to brush after that one! For ice cream and frozen yogurt in the Heights, Fat Cat Creamery is hard to top. Or it would be, anyway, if they didn’t provide the toppings themselves! Unique flavors like chai tea coconut ice cream and milk chocolate stout stuffed into waffle cones and sprinkled with graham-cracker crumbs ensure that you’ll delight in each and every calorie. Don’t skip the shakes—straws can help send all that sugar straight past your teeth! Turtle cheesecake, banana pudding, bacon cheesebread, and warm, gooey chocolate-chip cookies—have your Googled directions to Red Dessert Dive yet? This relaxed spot on Studewood is delicious enough to put you into a sugar coma. Luckily, their Boomtown coffee selection is plenty strong enough to keep you alert. Loyal customers describe this Mexican bakery off 27th Street as a feast for the senses, but the’ve got plenty for your belly, too. El Bolillo sells some of the best pan dulce and tres leches anywhere. Do you like churros? Even if you don’t, order a few anyway. You’re about to love them. If you’re not in the mood for sweets, their homemade tortillas have been known to make native Texans weep. It’s no surprise that in a city as hot as Houston, a shop specializing in delicious popsicles would thrive! Oh, you think fancy popsicles sound a little juvenile? A creamy vanilla bourbon with bacon-sicle might change your mind—fast. If you prefer a little spicy, try the jalapeño pineapple pop, or go simple with a coconut-sicle dipped in chocolate and pistachios. They’re perfect on a sweaty August day! It’s hard to say what this cute spot on White Oak Drive is better known for: the gourmet hot dogs, or the incredible homemade desserts. With more than 10 cheesecakes on offer daily, though, it’s clear that they’re serious about their sweets! They’ve also got delicious cake balls and even a bundt cake. You may not have room left for that chili dog! Gelato addicts might think they’ve died and gone to heaven inside this nearby White Oak Drive shop. 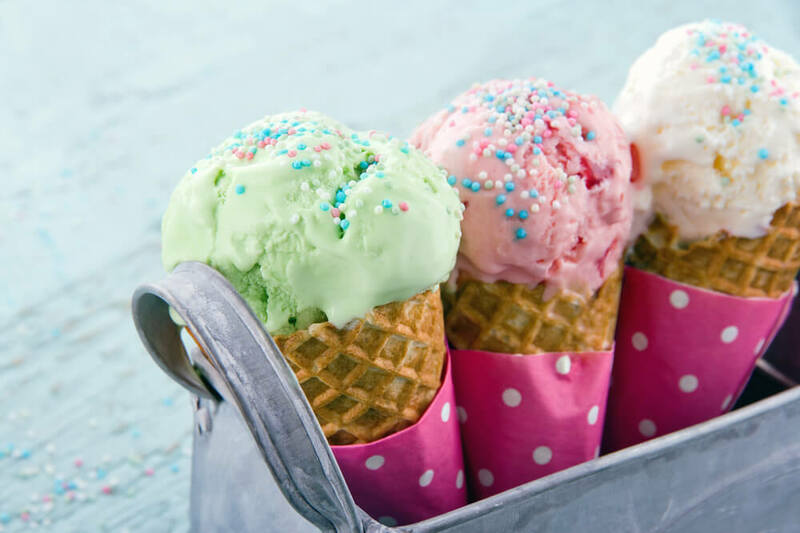 Enjoy huge selection of gelato flavors, from raspberry marscapone to birthday cake and cheesecake! You can get a cup or cone, but the true pros opt for the Squick: a big squirt of gelato between two cookies! BRUSH, people! Mango Beach, another shop located on White Oak Drive, looks just like a folksy stand you might find near the sand in a Mexican tourist town. It’s cash-only, but the juices and smoothies here are worth the trip to the ATM. Their signature treat is the (you guessed it!) Mango Beach, full of soft, sweet, fruit with the perfect amount of chili powder. If that’s not enough sugar for you, try a snowcone, instead—and be sure to book an appointment with us afterward! Don’t call it a snowcone! These pillowy, shaved-ice confections are something else entirely. They come in incredible flavors like creole cream cheese, king cake, watermelon, and tiger’s blood. The texture is a bit like eating a cold, sugary cloud, and if you really want to overdo it, you can have Mam’s add condensed milk, gummy bears, and other sweets. Use those straws! Is Fixing a Chipped Tooth Really Necessary?